Safety First! National Runner Safety Month – A Healthy Balance, Inc.
With the daylight hours dwindling by the day, outdoor exercisers are frequently forced to hit the pavement with the moon still high in the sky. 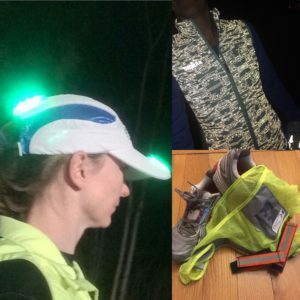 Here are some tips for staying safe on those dark runs. 1. Be SEEN. Light colored clothing is a great start, but don’t stop there. Consider accessories that blink and light up as well as reflective gear. 2. Stick to routes that you know are well lit and have sidewalks. 3. If running on sidewalks is not possible in your area, always run against traffic so you can see oncoming traffic. 4. Stay alert. Running is often a mental escape, but don’t get so lost in your thoughts that you neglect your own safety. Also consider leaving the music at home or, at the very least. with only one ear bud. 5. Be aware of solar glare. Sunsets and sunrises are one of the most dangerous times because they significantly cut down on driver’s visibility. 6. Make sure someone knows where you are going and when you expect to be back.